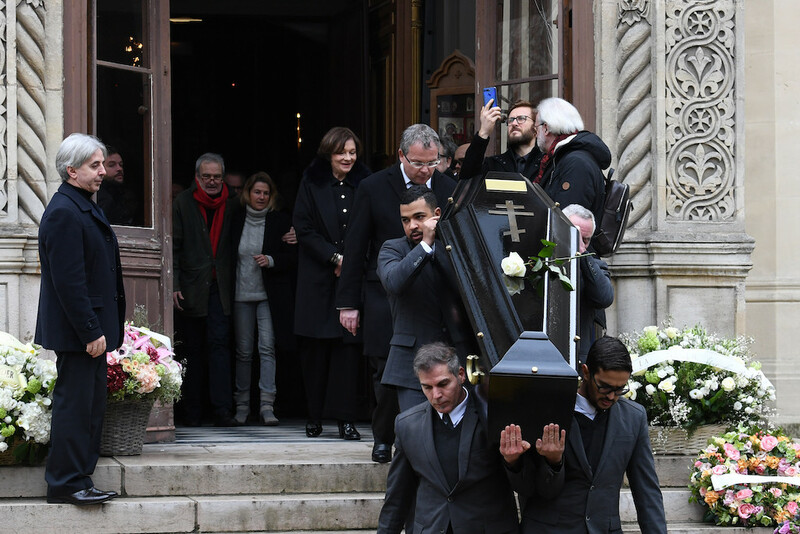 The legendary French film composer Michel Legrand was laid to rest Friday after a final standing ovation in a Paris theatre decorated to look like one of his favorite movies. The musician who scored such French screen classics as "The Umbrellas of Cherbourg" and "The Young Ladies of Rochefort" -- both starring Catherine Deneuve and directed by Jacques Demy -- died on Saturday aged 86. Legrand won three Oscars for his work in Hollywood, most famously for writing "The Windmills of Your Mind" for "The Thomas Crown Affair" in 1969, as well as the music for Barbra Streisand's "Yentl" ( 1984 ) and the "Summer of '42" ( 1972 ). A magic forest reminiscent of another Demy film, "Donkey Skin" -- which also starred Deneuve -- was created inside the Marigny theatre in Paris where his coffin was taken after a funeral service at the Alexander Nevsky Russian Orthodox cathedral. Clearly on the verge of tears, Demy's widow, the legendary French director Agnes Vardy, led the moving tributes to Legrand at the theatre. After the audience had risen to give him one last standing ovation, she said, "Having to talk next to Michel's coffin is a little difficult. The last time we saw each other we held each other's hands and I felt transported back to our years together with Jacques Demy." The cream of the French music and showbiz worlds had earlier crowded into the church, with Deneuve recalling the genius and energy of the man, who was planning a concert tour for April when he died suddenly. "We could feel the emotion that was coming straight from the music when we were recording 'The Umbrellas of Cherbourg'," she told French television on Thursday. "I can still remember entire passages of the lyrics" from the hugely influential musical, in which every line was sung. Brigitte Macron, the wife of French President Emmanuel Macron, was among the mourners, with Legrand taken from the theatre for burial at the Pere Lachaise cemetery in the east of the city. Paris mayor Anne Hidalgo had a giant screen set up outside the city's town hall to show the highlights of Legrand's seven-decade career. A musical prodigy, Legrand worked with the greats of jazz and popular music on both sides of the Atlantic from Miles Davis, Ray Charles and Frank Sinatra to Charles Trenet and Edith Piaf. Born into a musical family near Paris, he started out by playing songs on the piano he had heard on the radio. His father Raymond Legrand was a composer, and although he left the family home when his son was only three, he later helped him launch his career. His mother, of Armenian origin, enrolled him at the Paris Conservatory at the age of 10. He was to spend seven years there, before graduating with top honours in 1949.